We’d love your help. Let us know what’s wrong with this preview of The New Persian Kitchen by Louisa Shafia. This luscious and contemporary take on the alluring cuisine of Iran from cookbook author Louisa Shafia features 75 recipes for both traditional Persian dishes and modern reinterpretations using Middle Eastern ingredients. In The New Persian Kitchen, acclaimed chef Louisa Shafia explores her Iranian heritage by reimagining classic Persian recipes from a fresh, vegetable-focu This luscious and contemporary take on the alluring cuisine of Iran from cookbook author Louisa Shafia features 75 recipes for both traditional Persian dishes and modern reinterpretations using Middle Eastern ingredients. To ask other readers questions about The New Persian Kitchen, please sign up. Shafia, a professional cook with a Persian background, lightens and simplifies traditional Persian recipes and creates new ones with a focus on vegetables and a kind of whole food approach to Persian food. This isn’t a vegetarian cookbook, but many of the recipes are vegetarian. She starts with a brief history of Persian food and then a guide to the ingredients. This useful guide also explains how to prep Persian limes (and how to eat them), how to substitute herbs, why dried mint is good, how t Shafia, a professional cook with a Persian background, lightens and simplifies traditional Persian recipes and creates new ones with a focus on vegetables and a kind of whole food approach to Persian food. This isn’t a vegetarian cookbook, but many of the recipes are vegetarian. She starts with a brief history of Persian food and then a guide to the ingredients. This useful guide also explains how to prep Persian limes (and how to eat them), how to substitute herbs, why dried mint is good, how to prepare saffron for use, and how to prepare rose petals. Her nutritional science seems both updated and reliable. Color pictures focus on the food, but there is not a picture for every recipe. Recipes start with a small introductory paragraph, list the ingredients and their measures and provides general instructions, but don’t expect bowl or pan sizes just indications of large and small. Several short essays throughout explain the relationship between Jewish and Iranian food, healthy eating, how to open and peel a pomegranate (I recommend the water in a bowl method! ), differences within Islam, what is halal, and Persian Holidays. There are menus at the back. Writing a review of Naomi Duguid's Persia book reminded me of this great cookbook I already had--and more than anything else I already knew, it probably set the stage most for me to really appreciating Duguid's book, and not finding it intimidating (as more "ethnographic"-style books can sometimes be). Thanks to Shafia, I had a lot of ingredients on hand, and knew some techniques. This book is a *great* introduction to Persian food and is very practical about how to cook it in your own kitchen. I Writing a review of Naomi Duguid's Persia book reminded me of this great cookbook I already had--and more than anything else I already knew, it probably set the stage most for me to really appreciating Duguid's book, and not finding it intimidating (as more "ethnographic"-style books can sometimes be). Thanks to Shafia, I had a lot of ingredients on hand, and knew some techniques. This book is a *great* introduction to Persian food and is very practical about how to cook it in your own kitchen. It seldom calls for super-obscure ingredients, and the instructions are very precise. If you know nothing about the region's food, and really want to cook it (rather than fantasize about traveling or whatever), I'd recommend this as a starter much more than Duguid's. Wonderful. Shafia’s recipes are easy to make, and are grouped into sections that follow a Persian meal, so flipping through gives you a sense of progression, flavors, and style before you even get down to making anything. •Grilled shrimp with lime powder and parsley olive oil sauce (used lime juice and zest, since powdered lime wasn’t easily availab Wonderful. Shafia’s recipes are easy to make, and are grouped into sections that follow a Persian meal, so flipping through gives you a sense of progression, flavors, and style before you even get down to making anything. I loved that Shafia also pulled together suggested menus, sidebar content that looked at Iranian /Persian history and cuisine, and suggested workable substitutes for ingredients that might be specialty depending on where you live. I enjoyed the tastes but not always the textures of the recipes I made from this book. I didn't like any of the recipes ... I will return the digital version nothing appealing to a family who doesn't eat nuts or beans. What a gem! Beautiful, light, flavorful recipes and a vegetarian option for each one! I am excited to try some of these out. The New Persian Kitchen was educational and had interesting recipes. The book is printed on plain paper, clearly visible print and many (in my opinion not enough) color photos of many of the dishes. A few of the dishes come w/ a "vegetarian" option, the titles are printed in English in red with the Farsi below in a smaller brown script. There is a small explanation of the dish w/ optional variations & serving suggestions & the number of servings. The recipes & ingredients are clear easy to read & follow... but Middle Eastern cooking takes a bit of The book is printed on plain paper, clearly visible print and many (in my opinion not enough) color photos of many of the dishes. A few of the dishes come w/ a "vegetarian" option, the titles are printed in English in red with the Farsi below in a smaller brown script. There is a small explanation of the dish w/ optional variations & serving suggestions & the number of servings. The recipes & ingredients are clear easy to read & follow... but Middle Eastern cooking takes a bit of time when it comes to preparation, so these are not quick & easy meals. I really enjoy the discussion of spices, many of which I often use, and I found a better way to prepare my saffron before adding it to my dishes. The book is broken down to the following sections: Introduction; Overview; Guide to Persian Ingredients; ten (10) sections of Recipe; Menus; Resources; Acknowledgements; About the Author; and Index. The recipes for the most part are gluten free, use minimal of oil & fat, and call for alternatives to white sugar. There are several Jewish/Kosher recipes, which in my mind do not mix with the other dishes. Starters & Snacks: As the authors states Iranians really do not serve "appetizers" but a series of small plates to awaken the the palate & appetite.... Whole grilled fava beans; Winter squash fritters w/ rose petals; New potatoes w/ dill & lemon; Turkish roasted tomato & red pepper dip (Armenians serve this too); Garlicky eggplant & tomato spread; Passover Charoset (see...Kosher). Soups: Cold pistachio w/ mint & leeks; Saffron corn soup (this sounded really good); "Persian 'Matzoh Balls' w/ chickpeas & chicken (Riiiight); Savory amaranth & turkey porridge; Cleansing spring nettle soup; and one of My Favorites Ash-e Reshteh (Bean, herb & noodle soup). Salads: Chicken w/ potatoes & olives (Salad Olivie); Tomato & Cucumber; Vinegar carrots w/ toasted sesame seeds; & Radish, rhubarb & strawberry. Vegetable & Egg Entrees: Herb frittata w/ walnuts & rose petals (Kuku sabzi, very often served during lent & easter w/ fish); Roasted stuffed artichokes w/ mint oil (this sounded good); Stuffed tomatoes w/ pistachio pesto; and Tempeh kebabs w/ minty cilantro-lime sauce. Meat & Fish Entrees: Chilie-saffron fish kebabs; Parvin's tamarind stuffed fish; Lamb kebabs in pomegranate-walnut marinade (fesenjan sauce); Grilled liver w/ cumin, garlic, & fresh basil; and Turmeric chicken w/ sumac & lime. Main Dish Stews & casseroles: Pomegranate walnut stew (fesenjan); Barley stew w/ lamb & rhubarb; Seared chicken & peaches; Green herb & kidney bean stew w/ dried lemons (Gormeh sabzi, my favorite); and Persian gulf style spicy tamarind fish stew. Rice & Grains: Saffron rice (my favorite); Sweet rice w/ carrots & nuts; Rice w/ rose petals & barberries (sour); Quinoa w/ french lentils, wild rice & golden raisins; and Rice w/ favas (or limas) & fresh dill (another of my favorites & easy to make). Sweets: Chickpea & almond flour icebox cookies (yum); Rhubarb & rose water sorbet w/ rice noodles; pomegranate semifreddo w/ blood orange compote; Amaranth rice pudding w/ rose water; and No-bake persimmon & goat cheese cheesecake. Beverages: Salty mint yogurt soda; Sour cherry spritzer (so refreshing in summer); Cardomon coffee; Naturally sweet dried lime tea; and Winter orchard tea. I found myself wondering at this book as many of the ingredients are things that I use partially because of my interest in Indian cooking and partially because I love new ingredients. Salted limes, persimmons, pomegranates, and sumac showed up in some of this recipes. I ended up photocopying a few. Most of them were soups that were more hearty and had touches of acid or sour. One recipe included rhubarb in a savoury preparation. If these recipes become mainstays in my house, I may consider buying I found myself wondering at this book as many of the ingredients are things that I use partially because of my interest in Indian cooking and partially because I love new ingredients. Salted limes, persimmons, pomegranates, and sumac showed up in some of this recipes. I ended up photocopying a few. Most of them were soups that were more hearty and had touches of acid or sour. One recipe included rhubarb in a savoury preparation. Her fesenjan wasn't up to par with mine, however *smug face*, but she shortens the stewing time by quite a bit; which could be a positive. STILL CAN'T GET MY RICE ON POINT (ASHAMED). Overall accessible, pretty-look Whooo! 3.5 - i liked her last book a bit better, but this one was great for an intro to Persian cuisine from a healthy, sustainable perspective. There are about 10 pages or more at the beginning that are all Iranian culinary history and throughout the book there are other snippets of info, including how food from different religions is integral to the food of Iran. So I enjoyed that. That being said, none of the recipes blew me away though most of them sounded good. I haven't made anything from this yet, but most of the recipies were very approachable. The author also built in a lot of flexibility, providing vegetarian versions of several of the meat-based dishes. I'm looking forward to cooking from this - there are a mix of things that will be great for weeknights, for more involved weekend cooking, and potentially for entertaining as well. I've really enjoyed everything I've made from this book so far. It's great fun seeing ingredients I would normally use (and some new ones) transformed into satisfying and healthy dishes with really unusual flavors. 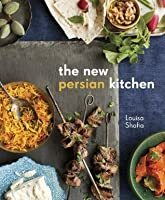 I would recommend this book even if you're not especially interested in Persian cuisine - the recipes are straightforward and delicious, and many are achievable for weeknight dinners. Lovely little book, delightful stories and info and recipes. The author grew up in America with an Iranian father and a Jewish mother. Loved the stories and recipes--only caveats that many ingredients are not going to be available here, and no nutrition info. But she does provide vegetarian options. I really enjoyed reading this cookbook. Although many of the recipes aren't recipes I'm longing to try some are intriguing and worth the experiment. What I appreciated most of all was learning about the history and cultural traditions of the Middle East and most especially of Iran. Louisa Shafia explained ingredients, told stories and provided recipes that are very well written. I have recently discovered I really like this style of cooking and did not have any experience with it. This is a great cookbook. It has glossary of unfamiliar ingredients in the beginning as well as some explanatory history of Persian Cusine. It is a mostly healthful style of cooking and I am excited to become more proficient at it. Living in Australia I have no idea where to get some of the ingredients required for these recipes - dried limes?! I really wanted to like this book and I did photocopy a couple of recipes but just wasn't really that into it. Also lacked pretty pictures which usually entice me to cook a dish. Gorgeously photographed and designed. The flavors sound intriguing, and there are a lot of gluten-free adaptations included, and the rest will be easy to substitute. I'm looking forward to playing with these recipes. This is more a beginner book. It has some nice recipes that are not hard or laborious, but I wanted something more inventive. She does do a good narrative of the traditions around food in the Persian culture though. Finally, a cookbook to really read and pore over. I checked in out from the library, but will purchase it. This is a beautifully put together cookbook with so many delicious recipes that I'm dying to try. Really want to buy this cookbook and make everything in it. Amazing. And I learned a lot about Iran/Persia, which was a nice bonus. There weren't very many recipes that I would actually make in this book but it was still interesting to see the ingredients that I wouldn't normally put together. I am going to try a few.